The Tower Obelisk is an impressive plant support topped with our pyramid finial. 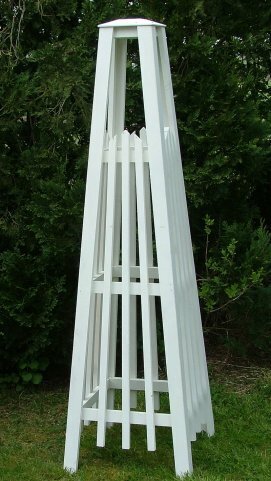 An obelisk is an attractive way to add height and structure to your garden as well as add support your plants. The Tower Obelisk is manufactured in our own workshops. Made from Scandinavian red pine and finished with either clear or golden brown preservative. To make your garden more productive and more interesting, too, consider an obelisk. It's practical and adds drama to a garden, climbing vegetables, fruits and flowers will clamber all over them. Put one near a recreational area or entrance and train scented plants such as jasmine up it. 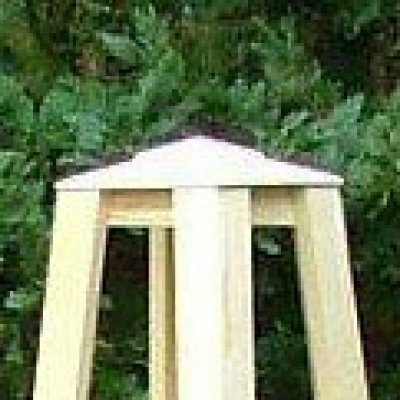 Or set an obelisk over a new patio planter full of climbers and see the climbers bring your obelisk to life. Smaller vegetables such as bush varieties of peas and beans, heavily bearing currants and many varieties of tomatoes will be happy with a smaller obelisk of a metre or so in height. Although, since tomatoes and currants don't produce tendrils for support, you'll need to use garden tape and choose an obelisk with a built-in grid or crosspieces. The ideal candidates for a two metre tall obelisk include pole peas, hops, Malabar spinach, pole beans, grapes, mountain yam, squash, melons and hyacinth bean. Squash and melons need the added support of a grid to aid hold up the heavy fruit. Then of course you will find the plants that are cultivated for their flowers. Clematis along with autumn clematis: Often called the queen of vining flowers, clematis, Clematis paniculata, produces light lavender blossoms on woody vines. Its cousin, autumn clematis, maximonowicziana, creates smaller, less ornate, but more aromatic flowers in autumn. Both forms of clematis prefer morning sun and protection against the afternoon sun, although autumn clematis is far more tolerant of all-day sun. Mulch them well, they like their roots kept cool as well as evenly moist. Honeysuckle: A prolific flowering vine, honeysuckle, Lonicera sempervirens, also known as "coral honeysuckle," swiftly grows to cover any garden structure. It generates many small, trumpet-shaped, coral, yellow or red, fragrant flowers from mid-spring through autumn. Native to the Americas, coral honeysuckle thrives best in sun to partial shade.